Now you can teach students living thousands of miles away from you using our world-class virtual classroom and online whiteboard software. Become an online tutor, apply to jobs in other cities and multiply your income. Teach all the students you want for as long as you want without paying a cut of your fees to us. Our Basic profile is free while you need to purchase Connects to apply to the tutoring jobs that you want. Let us handle your payments and bookings and focus on what you do best - teaching and bringing concepts to life. No more worrying about getting paid on time or chasing students for payment - we will handle it all for you. 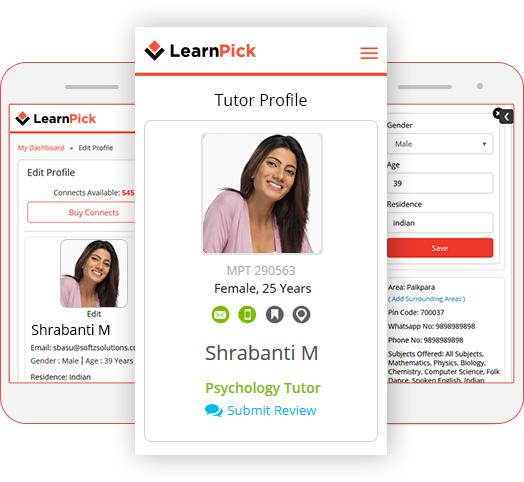 Every day thousands of students visit LearnPick to look for great tutors like you. Their requirements are posted on our website and app as 'Tuition Jobs'. You can apply to the jobs that you are interested in, contact the students and get hired. Students can also contact you directly and request you to be their tutor. Connects are an internal currency used by LearnPick. Connects are required to apply to jobs that interest you and to respond to messages sent by students to you. You can purchase connects in packs of 25, 50,100. 25 Connects is valid for 6 months while others are valid for 1 year from the date of purchase. Connects can be purchased on LearnPick through your My Accounts page. You can pay via Cash, Credit Card or Netbanking. Am I guaranteed to get the tuition job I'm applying to? No. The decision rests upon the student or parent who has posted the job. LearnPick takes no part in the decision making. We act as a platform for facilitating the interaction between tutors and students. We provide a state-of-the-art virtual classroom and online whiteboard. You can teach any student - whether obtained via LearnPick or not - using our online tutoring facility. We also provide integrated class scheduling, messaging, document upload and payment facilities. 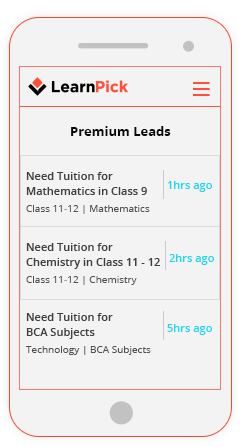 As soon as tuition has been agreed upon, the tuition fee will be added by the student to his/her LearnPick account via Credit/Debit card, Netbanking, Payu or Paytm. This amount will be released to your account once the student approves your request for payment after the lesson is complete. It is advisable to keep a record of the classes. If I'm hired by a student, is it compulsory to book the class on ? Your payments are guaranteed as long as you complete the agreed lessons. No need to worry about chasing the student for fee payment. You get access to our online whiteboard and virtual classroom software so that you can take some lessons online if you want. You can get authentic, verified reviews from your students which will push up your profiles visibility to students.